I see many bloggers already showcasing beautiful Christmas decor, inspirational DIY crafts, and yummy, festive recipes. And why not? After all, Christmas is coming! But how do they all do it? I have to admit, yesterday it made my shoulders sag a little. I was feeling totally wiped out from the Thanksgiving festivities, on the couch, relaxing in the glow of food and family, doing a little knitting and movie watching. We've had three college guys with us since Tuesday (my son and two of his friends), in addition to extra family on Thanksgiving Day, so I've been cooking most of the time. So thankful I thought ahead and put lasagne, a breakfast casserole, muffins, and pumpkin bread in the freezer to supplement what I've been making this week. Three 21-year-old men can eat a lot of food. The autumn dish towels and potholders, with their yellows and oranges and browns, have been washed and put away. The table linens are cleaned and folded or hung up. I pulled out my candles for Advent, but haven't found the wreath yet. My husband set up both trees this afternoon. And that's about as far as we've gotten. Tomorrow, when everyone's back to work and school, I will have a quiet morning on the couch, praying and reading (aka still recuperating), and then I'll be ready to be up and doing. 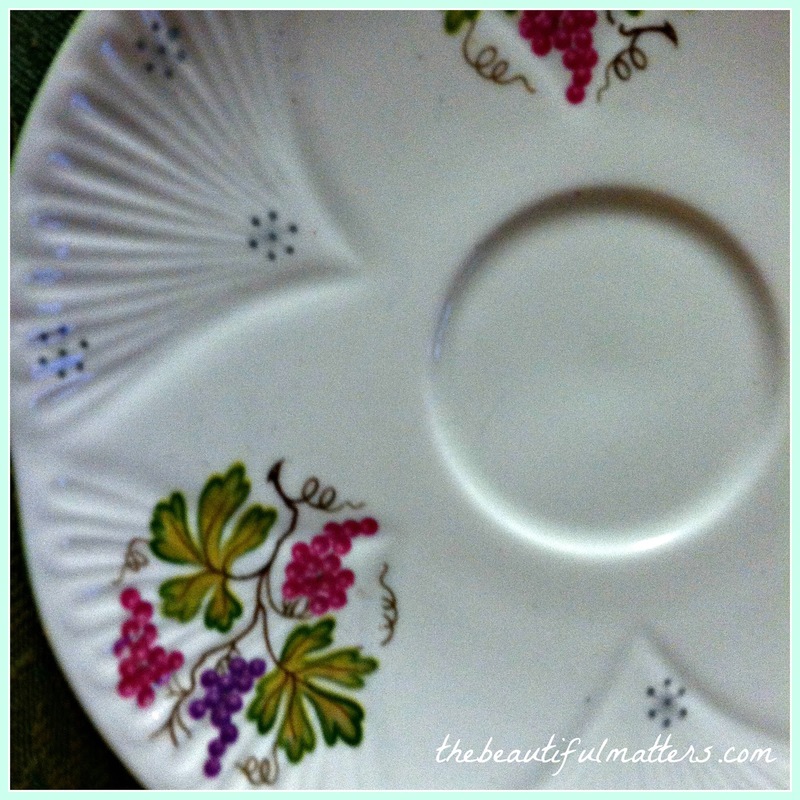 Decorating the trees, washing the sheets, getting out the Christmas china. I'll put on some Christmas music and enjoy the peacefulness I hope to cultivate this Advent season. In the meantime, right now I'll just enjoy what everyone else is posting, and sip a hot cup of tea. This teacup seems apt for a transition time. Berries and vines and snowflakes. A little odd, don't you think? Fall or winter? Maybe as odd as yellow roses left over from the Thanksgiving table next to purple and pink Advent candles. But, really, you can't argue with a Shelley. I'm also looking forward to setting up a couple puzzle stations for people to enjoy this month. 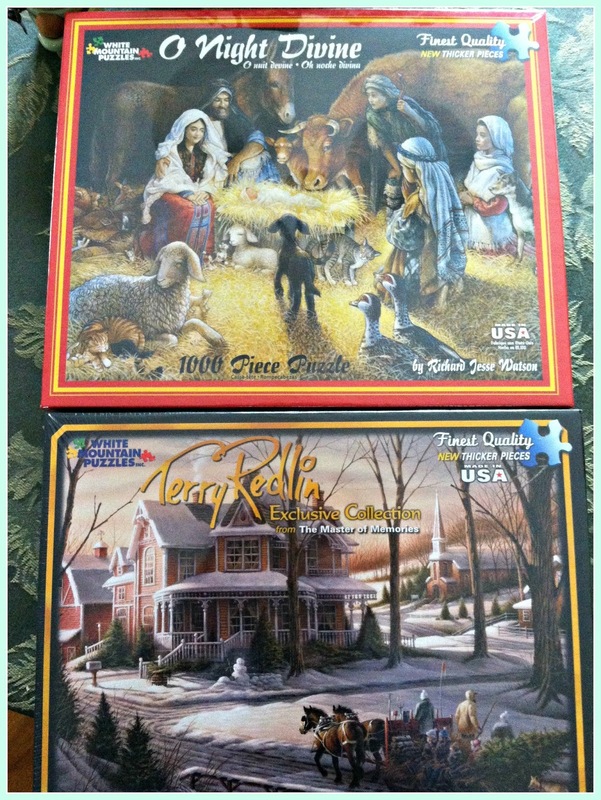 I found these two beautiful 1000-piece puzzles on Amazon. How are you doing? Are you all decorated yet? Or still feeling the effects of a busy, happy Thanksgiving? Thank you for your heartening post. I like your tea cup and I can only imagine how tasty the hot tea tastes after all the busyness (is that a word? ).I am not sure at the moment. I just returned home from a two and a half day holiday visit - only a short time ago - with a three and a half hour drive from my daughter and husband's home. I had not been welcome there for ten years and the visit had its up and very lows. It is always good to be home and I'm so very thankful to God for the safe return and the warmth of my little home. I certainly understand your thoughts on all the Holiday preparation and Time! Thank you again for a post that helped my heart and felt good! Blessings. Thank you Mary, and I'm so glad you visited me today. The day after Thanksgiving I jumped right into the finishing stages of moving my parents, This is the final stage for the winter months, and we will resume again in the spring, it will take me until a week before Christmas to finish up. I may opt out on putting a tree up this year as I'm really too busy to think about it. Your Thanksgiving sounded busy but delightful! Having your son home and then to have the opportunity to open your home up to others, I love it! Wonderful!! Rest up, and then enjoy all that comes with preparing for this beautiful time of year. Wow, 3 college guys, yes you needed a lot of food!! I know you had fun! I always feel a wee bit sorry for our dear neighbours to the south who have Thanksgiving so late in the year. That said, I don't have any Christmas decor out either. I like to observe Advent and waiting, so I'll decorate slowly adding bits and pieces. We ate our lunch with the first Advent candle lit and read the meditation from an online Advent calender (John Piper's). Tomorrow I'll put the wreath on the front door and maybe do some pots of greenery. And put the Nativity set out. How fun to have had 3 young men around. I can imagine the amount of food you went through! Enjoy your week, Deborah. You are way ahead of me so drink your tea and recover. I liked the idea of a puzzle station!! Kids are coming from Fl. I think we are getting a real tree for all the Grand kids. Hi Deborah, I feel the same way as you! It is a lot of work getting ready for Thanksgiving and then having guests stay too. We are in the in between stage too in my house and I still have so much to take care of. The cup of tea looks so good. Have a good week. I know you must be exhausted after such a busy Thanksgiving. Those roses are gorgeous! Wishing you a peaceful day to begin your Christmas decorating. Yesterday in Georgia, our high was 67. Most all the neighbors put up their outdoor Christmas lights while the weather was so nice! Glad you pulled through this busy Thanksgiving and oh my, I remember cooking for all nine of us at home. My brothers (4) could eat a LOT. But I always loved cooking for big crowds and it is a pleasure to see them have seconds. There always is enough left over for easy days afterwards; that is my reward too. Still love to cook big quantities and than freezing some of it to make life easier. Feeding three college guys takes a lot of work, Deborah, and I can see why you needed a tea break with your pretty teacup. I dragged all the stuff in and decorated over Friday and Saturday. I sometimes wonder why we do all this, but when it's all finished, it's so rewarding. I listened to Christmas music and enjoyed that immensely. There's just something so soothing about soft music in the background. Deborah, you know from your visit to Poppy View earlier, that we're on the same page with this transitioning from turkey to tinsel! I'm taking it easy - for now, but will have to get my act in order as my daughter, Liberty, will be flying home this month to spend Christmas with the folks! This all makes for a very merry mama, so I'd better start doing the actual legwork since the house isn't going to decorate itself! 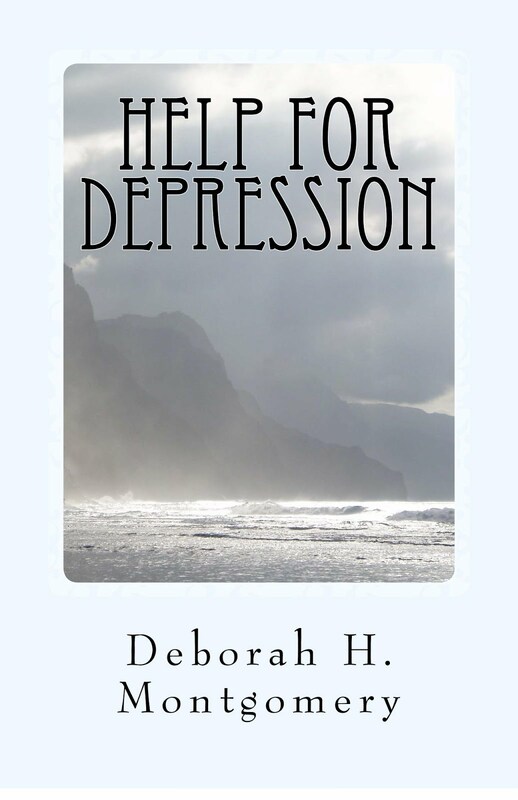 Hi Deborah, loving your transitional time between holidays. I am going to make it a point to relax this week now that my home is decorated and the big stuff complete. How fun to have the house guests over Thanksgiving and how smart of you to plan ahead with the meals. Love your teacup and the tea looks delicious. 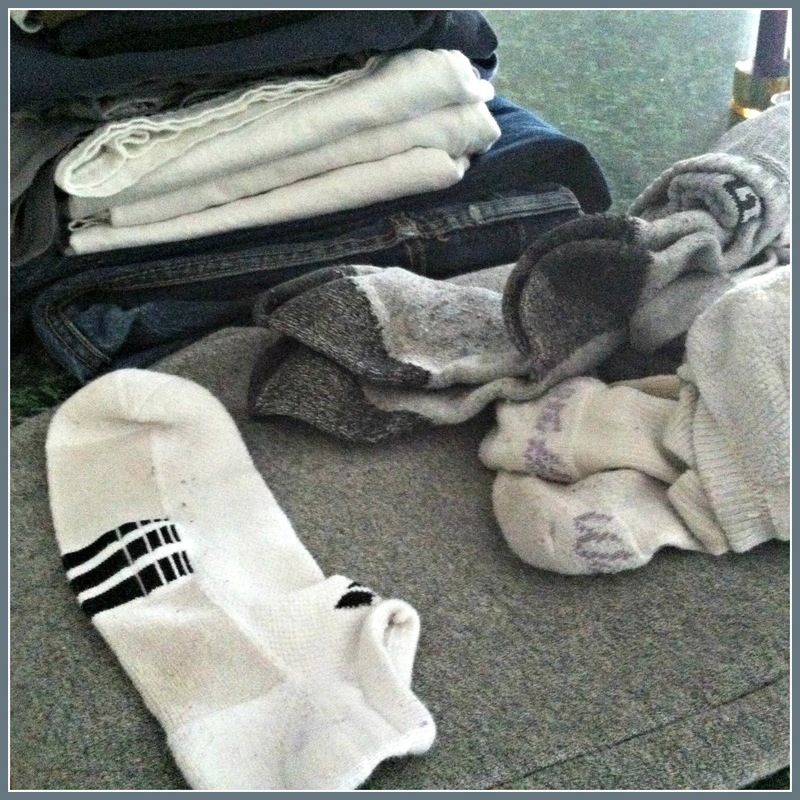 Yes, where do those lone socks disappear to?? Love the puzzles you've chosen for the month. I have done this too and everyone loves it. Wishing you a wonderful first week of December and Happy Decorating!! Well I am only getting started too! But I think I never get done. But that's okay because I enjoy it so much. We were away for Thanksgiving and I am so glad to be back home. You are so good to feed your son's friends too! I raised boys so I know about the endless cooking! Have a lovely December! You're way ahead of me, sweet friend. I'm finding myself in the slow lane and with my shoulder issues, the thought of decorating a tree makes me wince. I need to get off the sofa and make an effort, but some years I'd just like to skip all the end-of-year festivities. Aren't I some Scrooge? Not a Scrooge. I can totally relate. This is the first time in years that I feel energized and eager fo christmas (which was/is a most favourite time of year). What about a table top tree this year? Quiet morning here too, Deborah, now that all the college chickadees have flown back. I am recuperating and not rushing at all. I seem to be savoring the seasons a little more each year. I have been playing Christmas music though. ;) Never too soon for that. I have the tree up and a little bit of decorating done. I'm not doing much this year. Actually I seem to do less every year. If you were to walk into my home fifteen years ago, you would be surprised because every room in the house was decorated. I seem to be running out of steam the older I get. But then I do have issues I never used to have. Your teacup is a pretty one and I think one of the charms about teacups is their different patterns and unrelated motifs. Your tea sounds lovely. 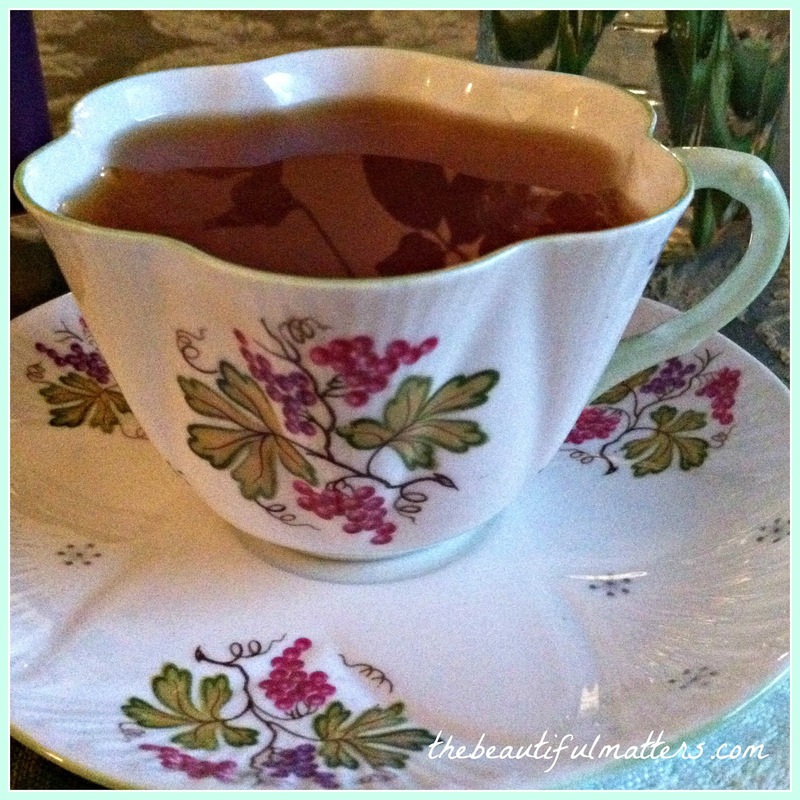 Thank you for sharing and joining me for tea and get rested up! I haven't started yet either...other than wreath on the door...but...it's okay! 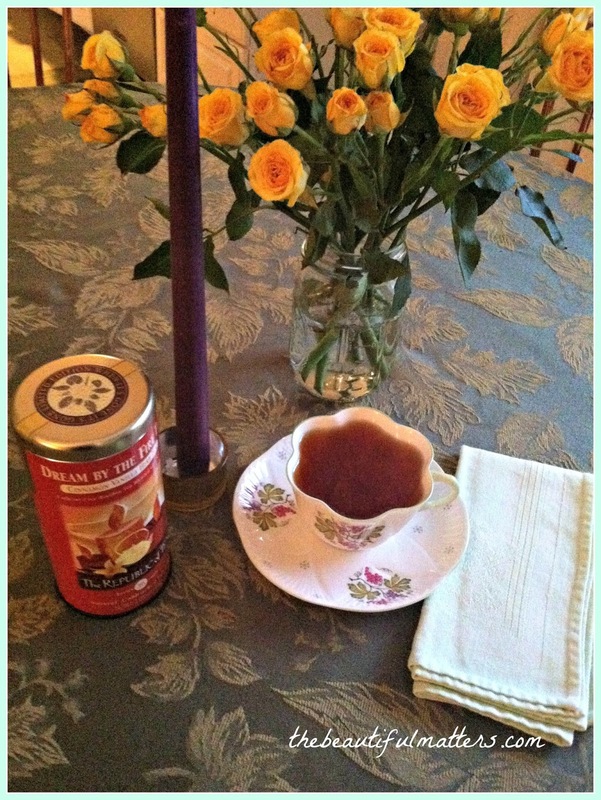 Love the Shelley teacup. They made a lot of combination patterns but the Snow Crystal with the Grape is very different for them. But I love it anyway! I have 3 20 + grandsons, and yep...they sure can eat! Hope you have a restful time before bsing up and doing again! The yellow roses are beautiful! Sounds like you are keeping busy keeping everyone fed! 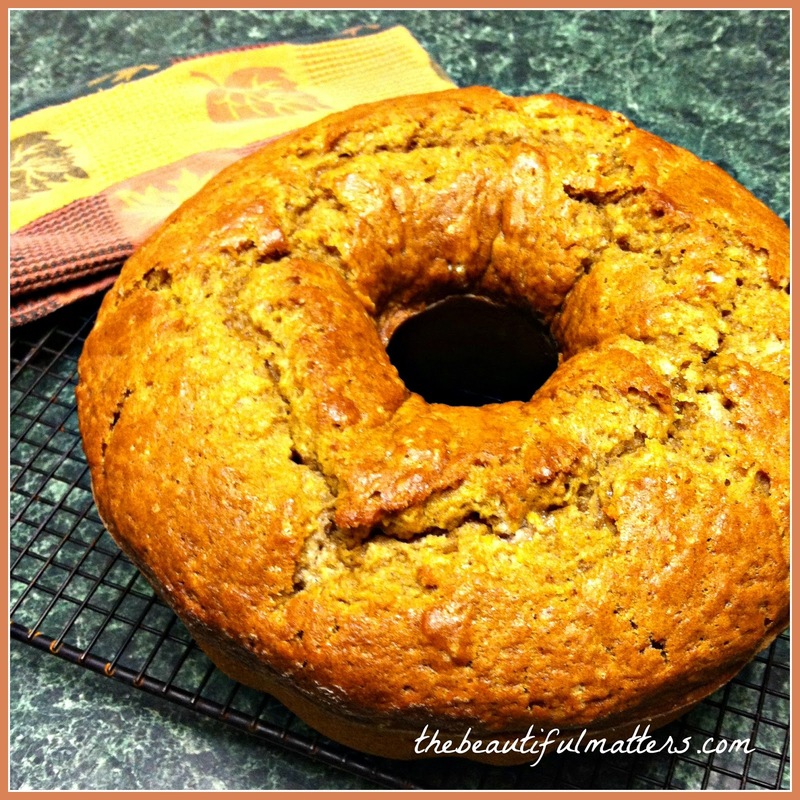 I think we all need a little time to recuperate (and eat leftovers) after Thanksgiving! Can't they eat? I now have a 21 and 20 year old. You can really spend the entire vacation cooking! Do take a moment and put your feet up Deborah. We did after Thanksgiving and ordered pizza several nights. I just can't seem to get enough rest this past weekend, boy did it feel good! Have a great week! Hi Deborah! That Shelley is so pretty :). My house is pretty much done, but my secret is I started the weekend before Thanksgiving...and I went to my parent's house for the meal, so the fact that my house was a torn up mess didn't matter :). I also did way less cooking then you did...I just had to make two sides. I'm looking forward to seeing everything when it is up! 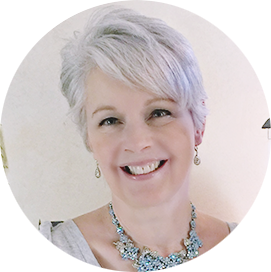 Have a great week, and thanks for stopping by my blog! Deborah, I was here earlier today to leave a message, but I'm not sure what happened to it because it disappeared on me. I'll try again. I love that interesting teacup with flowers and snowflakes. And those puzzles look wonderful. I, too, like a puzzle corner for this time of year. Enjoy your down time....ease into it when you are ready! I could have written your thoughts (especially at the beginning of this) myself. I do know how people have the time to be all decorated and spiffed already. I guess I'm just slow. I am trying to savor this season too. In fact, yesterday as I was dragging out Christmas stuff, I had the urge to drag half of it back "in" and keep it realllllly simple this year. As evidenced by the boxes all over my place, I'm still in indecision. I think we've gotten into a "need to get it all done immediately" mode as far as decorating for Christmas is concerned. Take your time and remember the reason for the season -- the Advent wreath, the creche and the trees will come in time. Life is too short! I agree with what Martha said in her above comment. I tend to go slowly about this so I can enjoy the season completely. I do love that Shelley. AND Roses go with everything! You know, Deborah, I think it is only in today's society that we rush Christmas like we do. When I was growing up (in the 60's), no one put up decorations until sometime in December. Many families (like ours) put up the tree on Christmas Eve. In the early days of having my own family, I put up the tree the day after Thanksgiving, but in recent years, I've begun waiting until sometime in December. I want to focus on one holiday at a time. I will probably decorate next week, but in the meantime, I am enjoying reading Christmas books. 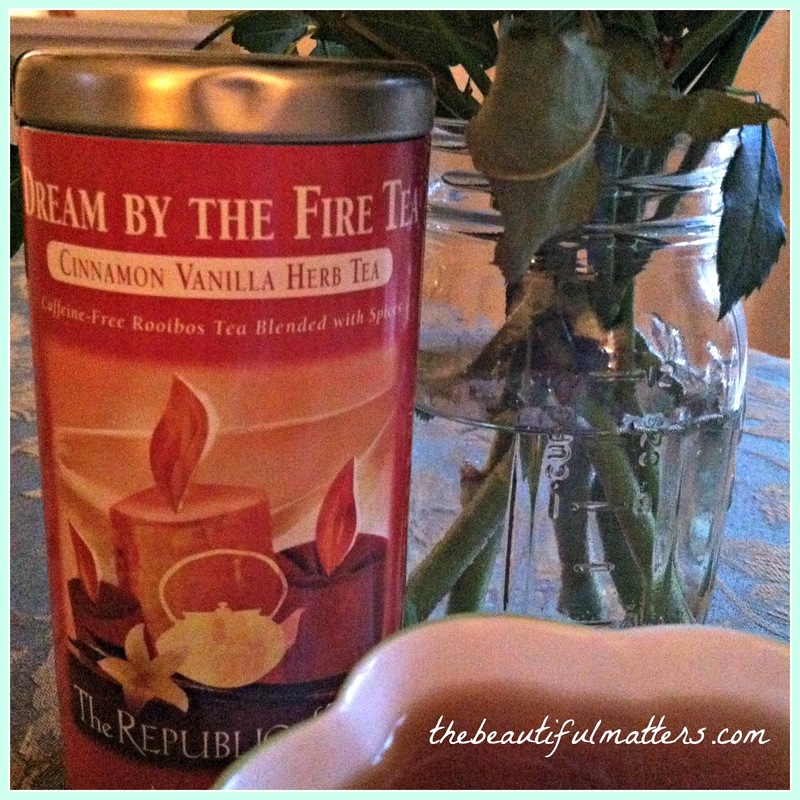 That cinnamon vanilla tea sounds divine. I will have to look for that. Your teacup is like my silver snowflake ones Deborah, perfect to use all winter! I'm all decorated and think Dream by the Fire tea sounds heavenly for this time of year. I have a bag of cinnamon vanilla from an exchange and will give it a try. We were at a friend's place for dinner last night and he really enjoys doing puzzles, nothing less than 800 pieces he says so it is a challenge. Have fun working on the 2 you picked up. Hello Deborah, I have been wondering the same thing too. I am so glad to hear that you have been asking yourself the same question. I have been feeling left behind and even wondered if I am just not dedicated enough. But it is impossible for me to keep up with everyone else. Having a full-time job, a house to keep and trying to start a little business leaves me with little time for blogging. Sometimes I feel tremendously guilty because I don't get around to visiting my blogger friends as much as I would like to. Add the holiday season, well I am sure we all can relate. But you have the right idea Deborah, we must set aside a few moments to relax and enjoy a lovely cup of tea. And you have a gorgeous one in that Shelley pattern. I love your pic of your laundry. That is just perfect and ezactly what my life is too. Enjoy your beautiful family and may your holidays be full of laughter and blessings. 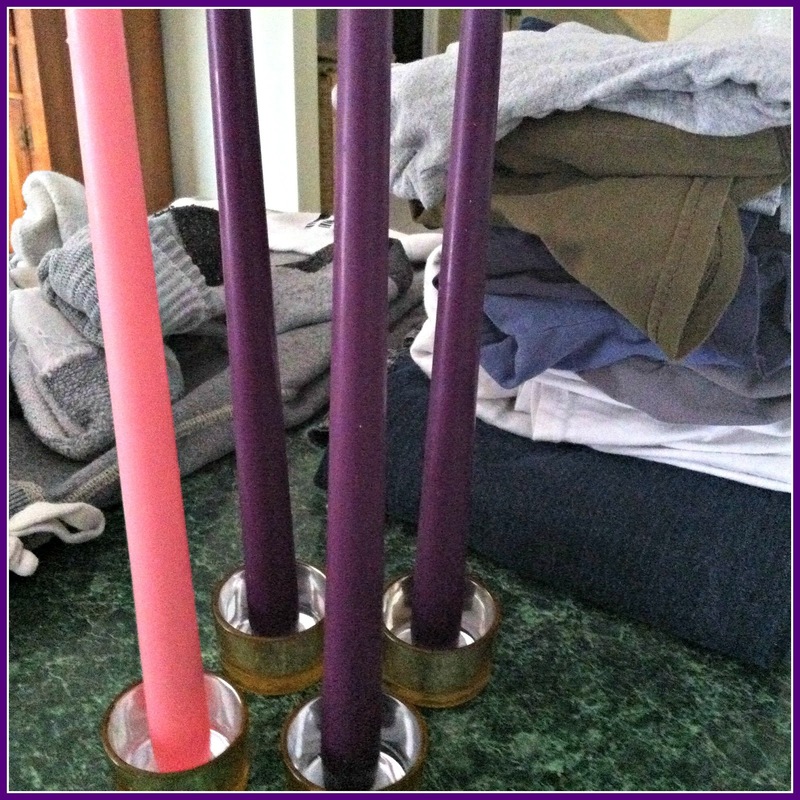 I believe this is two years in a row that the first Sunday of Advent has come hard on the heels of Thanksgiving, and it is a wearying challenge to make that fast shift! As a pastor's wife, it was difficult -- when we were cleaning up from our HUGE Thanksgiving dinner at church for a crowd, I put away the Thanksgiving decorations in the fellowship hall, and immediately put up the Christmas ones, digging around for our sanctuary Advent wreath. Same thing at home! We must "cultivate" the peace of this season, as you say -- I love that term! It is intentional, but peaceful. Greetings from Maine, dear Deborah! What a lovely post...and I had to smile about the "extra" sock...with three boys it seemed as though that was always happening around here! You have such a lovely blog...I really enjoyed my visit and will be back soon!